This portrait's bold brushwork, stark contrasts of light and dark, and frank presentation of the sitter reflect Manet's early passion for seventeenth-century Spanish painting. Madame Brunet, the wife of a friend, rejected the painting on account of its perceived ugliness, however, and the artist retained it in his studio. He eventually cut off the bottom portion of the canvas, reducing it to a three-quarter-length portrait, and displayed it in his one-man exhibition in Paris in 1867--a show of independence opposite the World's Fair, where more polished examples of society portraiture, like James Tissot's Portrait of the Marquise de Miramon (also in the Getty's collection), could be seen. Galerie Durand-Ruel (Paris), sold to Jacques-Emile Blanche, 1884. M. Knoedler & Co. (Paris), sold to Joan Whitney Payson, November 29, 1933. Source: Getty Research Institute, M. Knoedler & Co. records, Customer cards, Box 119, Mrs. Charles S. Payson card, no. F902. Joan Whitney Payson, 1903 - 1975 (New York), by inheritance to her daughter, Sandra Payson, 1975. William Koch (New York), sold to a private collector, 1995. Private Collection (New York), sold through Luhring Augustine, New York, to the J. Paul Getty Museum, 2011. Martinet, Louis, and Edouard Manet. Expositions Martinet [Notes et documents, manuscrits et photographiques sur Manet] (unpublished, 1863), unpaginated, no. 133. Catalogue des tableaux de M. Édouard Manet exposés avenue de l'Alma en 1867 (Paris: L. Poupart-Davyl, 1867), p. 11, no. 20. “L’exposition d’Edouard Manet.” Journal Amusant, no. 600 (June 29, 1867), p. 7, ill [caricature]. Hôtel Drouot, Paris. Catalogue de tableaux, pastels, études, dessins, gravures par Édouard Manet. February 4-5, 1884, p. 11, lot 15. Bazire, Edmond. Manet (Paris: A. Quantin, 1884), p. 54n1. Duret, Théodore. Histoire d'Édouard Manet et de son oeuvre (Paris: H. Floury, 1902), p. 196, no. 20. Ganay, Madame la Marquise de. Exposition de chefs-d'oeuvre de l'école française: Vingt peintres du XIXe siècle, exh. cat. (Paris: Galerie Georges Petit, 1910), p. 29, no. 120. Meier-Graefe, Julius. Edouard Manet, mit 197 Abbildungen (Munich: R. Piper & Co., 1912), pp. 111-12, 318, no. 15. Proust, Antonin. Édouard Manet: Souvenirs (Paris: Librairie Renouard, 1913), p. 53, no. 20. Duret, Théodore. "Les Portraits peints par Manet et refusés par leurs modèles." La Renaissance de l'art français et des industries de luxe, no. 5 (July 1918), pp. 149-50. Duret, Théodore. Histoire de Edouard Manet et de son oeuvre. Rev. ed. (Paris: Bernheim-Jeune & Cie., 1919), pp. 236-37, no. 20. Cent ans de peinture française: Exposition au profit du Musée des beaux-arts de Strasbourg, exh. cat. (Paris: 18 rue de la Ville-l'Évêque, 1922), unpaginated, no. 105, ill.
Blanche, Jacques-Émile. Manet (Paris: F. Rieder & Cie., 1924), p. 31, pl. 3. Moreau-Nélaton, Étienne. Manet raconté par lui-même. 2 vols. (Paris: Henri Laurens, 1926), vol. 1, pp. 44, 47, 150, fig. 49. Duret, Théodore. Histoire de Edouard Manet et de son oeuvre. 4th ed. (Paris: Bernheim-Jeune, 1926), pp. 236-37, no. 20. Blanche, Jacques-Émile. Propos de peintre: De David à Degas (Paris: Éditions Émile-Paul Frères, 1927), pp. 148-49. Portraits et figures de femmes: Ingres à Picasso, exh. cat. (Paris: Galerie de la Renaissance, 1928), p. 20, no. 120. Jamot, Paul, Georges Wildenstein, and Marie-Louise Bataille. Manet. 2 vols. (Paris: Les Beaux-Arts, 1932), vol. 1, pp. 118-19, no. 39. Sterling, Charles, Paul Valéry, and Paul Jamot, eds. Exposition Manet, 1832-1883, exh. cat. (Paris: Musée de l'Orangerie, 1932), p. 5, no. 6, ill.
Colin, Paul. Edouard Manet (Paris: Librairie Floury, 1932), p. 21. Jamot, Paul, Georges Wildenstein, and Marie-Louise Bataille. Manet. 2 vols. (Paris: Les Beaux-Arts, 1932), vol. 2, p. 63, fig. 150. Figure Pieces, exh. cat. (New York: M. Knoedler & Company, 1937), unpaginated, no. 16, ill.
Rey, Robert. Manet. Eveline Byam Shaw, trans. (London and Toronto: William Heinemann, 1938), pp. 79, 162, ill.
Exhibition of Paintings for the Benefit of the American Friends of France. The Four Great Impressionists: Cézanne, Degas, Renoir, Manet, exh. cat. (New York: Durand-Ruel Galleries, 1940), unpaginated, no. 14, ill.
Jedlicka, Gotthard. Edouard Manet (Erlenbach-Zurich: Eugen Rentsch, 1941), p. 39, ill.
French Painting from David to Toulouse-Lautrec: Loans from French and American Museums and Collections, exh. cat. (New York: Metropolitan Museum of Art, 1941), p. 26, no. 79, fig. 34. Wehle, Harry B. "French Painting from David to Toulouse-Lautrec." Bulletin of the Metropolitan Museum of Art 36, no. 2 (February 1941), p. 33. Reifenberg, Benno. Manet (Bern: Alfred Scherz, 1947), pl. 1. Tabarant, Adolphe. Manet et ses oeuvres (Paris: Gallimard, 1947), pp. 57-58, 535, no. 60. A Loan Exhibition of Manet for the Benefit of the New York Infirmary, exh. cat. (New York: Wildenstein, 1948), pp. 41, 52, no. 8, ill.
Bex, Maurice. Manet (Paris: Éditions Pierre Tisné, 1948), p. 32, pl. 6. Sandblad, Nils Gösta. Manet: Three Studies in Artistic Conception. Walter Nash, trans. (Lund: C. W. K. Gleerup, 1954), p. 83. De Leiris, Alain. "Manet's 'Christ Scourged' and the Problem of His Religious Paintings." The Art Bulletin 41, no. 2 (June 1959), p. 200n11. Paintings, Drawings and Sculpture Collected by Yale Alumni, exh. cat. (New Haven: Yale University Art Gallery, 1960), p. 48, no. 47, ill.
Rewald, John. The History of Impressionism. 3rd ed. (New York: The Museum of Modern Art, 1961), pp. 32, 34, ill.
Courthion, Pierre. Edouard Manet (New York: Harry N. Abrams, 1962), pp. 12, 24, fig. 6. Orienti, Sandra, and Marcello Venturi. L'opera pittorica di Edouard Manet (Milan: Rizzoli, 1967), p. 91, no. 56, ill.
Bodelsen, Merete. "Early Impressionist Sales, 1874-94, in the Light of Some Unpublished 'Procès Verbaux.'" Burlington Magazine 110, no. 783 (June 1968), p. 344, no. 15. New York Collects: Paintings, Watercolors and Sculpture from Private Collections, exh. cat. (New York: Metropolitan Museum of Art, 1968), p. 14, no. 93. Isaacson, Joel, ed. Manet and Spain: Prints and Drawings, exh. cat. (Ann Arbor: Museum of Art, University of Michigan, 1969), p. 19. Rouart, Denis, and Daniel Wildenstein, eds. Edouard Manet: Catalogue raisonné. 2 vols. (Lausanne and Paris: La Bibliothèque des arts, 1975), vol. 1, pp. 50-51, no. 31, ill.
Isaacs, Paul Abe. “The Immobility of the Self in the Art of Edouard Manet: A Study with Special Emphasis on the Relationship of His Imagery to that of Gustave Flaubert and Stéphane Mallarmé.” Ph.D. diss. (Brown University, 1976), p. 241. Johnson, Lee. "A New Source for Manet's 'Execution of Maximilian.'" Burlington Magazine 119, no. 893 (August 1977), p. 564n11. Hanson, Anne Coffin. Manet and the Modern Tradition (New Haven and London: Yale University Press, 1977), pp. 195-96. Daulte, François, et al., eds. From Goya to Wyeth: The Joan Whitney Payson Collection, exh. cat. (Tokyo: Yomiuri Shimbun Sha, 1980), unpaginated, no. 16, ill.
Cachin, Françoise, et al, eds. Manet, 1832-1883, exh. cat. (Paris: Galeries nationales du Grand Palais; Éditions de la Réunion des musées nationaux, 1983), pp. 53-55, no. 5, ill., entry by Charles S. Moffett; p. 118, under no. 36, entry by Juliet Wilson-Bareau. Stuckey, Charles F. "Manet Revised: Whodunit?" Art in America 71, no. 10 (November 1983), p. 165. Herbert, John, and Mark Wrey, eds. Christie's Review of the Season (Oxford: Phaidon, 1984), p. 86, ill.
Christie's, New York. Impressionist and Modern Paintings and Sculpture. May 16, 1984, pp. 54-57, lot 22, ill.
Courthion, Pierre. Edouard Manet (New York: Harry N. Abrams, 1984), pp. 10, 22, fig. 6. Wollheim, Richard. Painting as an Art: The A. W. Mellon Lectures in the Fine Arts, 1984 (Princeton: Princeton University Press, 1987), pp. 144-45, 157, 159, 168, 170, figs. 104, 126, 138. Wivel, Mikael, et al, eds. Manet, exh. cat. (Copenhagen: Ordrupgaard, 1989), pp. 64-67, no. 4, ill.
Cachin, Françoise. Manet (Paris: Chêne, 1990), pp. 36, 149, no. 4, ill.
Bacherich, Martine. Je regarde Manet (Paris: Éditions Adam Biro, 1990), p. 111. Darragon, Éric. Manet (Paris: Éditions Citadelles, 1991), pp. 60-61, 388, fig. 289. Wilson-Bareau, Juliet. Review of Art in the Making. Impressionism. National Gallery, London. Burlington Magazine 133, no. 1055 (February 1991), p. 129. Kimmelman, Michael. "Masterworks on Summer Vacation at the Met." The New York Times (August 9, 1996), ill.
Fried, Michael. Manet's Modernism, or, The Face of Painting in the 1860s (Chicago and London: University of Chicago Press, 1996), p. 498n175. Dolan, Therese. "Skirting the Issue: Manet's Portrait of Baudelaire's Mistress, Reclining." The Art Bulletin 79, no. 4 (December 1997), p. 619n45. Armstrong, Carol. Manet Manette (New Haven and London: Yale University Press, 2002), pp. 11, 15, 20, 28, 86, 324n24, 339n8, 340n26, fig. 40. Tinterow, Gary, et al., eds. Manet/Velásquez: The French Taste for Spanish Painting, exh. cat. (New York: Metropolitan Museum of Art, with Yale University Press, 2003), pp. 390, 393, 394, 493-94n3, under no. 144, entry by Juliet Wilson-Bareau. Laessøe, Rolf. "Édouard Manet's 'Le Dejeuner sur l'herbe' as a Veiled Allegory of Painting." Artibus et historiae 26, no. 51 (2005), p. 215n9. Lehmbeck, Leah. "Edouard Manet's Portraits of Women." Ph.D. diss. (New York University, 2007), pp. 68-69, 74-79, 230, pl. 51. Des Cars, Laurence. "Le peinture en morceaux." In Manet: Inventeur du Moderne, exh. cat. (Paris: Musée d'Orsay, with Gallimard, 2011), p. 54n31. Allan, Scott. "A 'French Mona Lisa' Comes to L.A.: Manet's 'Portrait of Madame Brunet.'" The Getty Iris (December 2, 2011), http://blogs.getty.edu/iris/a-french-mona-lisa-comes-to-la-manets-portrait-of-madame-brunet/ (accessed December 2, 2011). Escard-Bugat, Myriam. "Dernières acquisitions du Getty." L'objet d'art, no. 475 (January 2012), p. 20, ill.
Hislop, Susanna, and Anna Beketov. "Acquisition of the Year." Apollo 176, no. 604 (December 2012), p. 47, ill.
Stevens, MaryAnne. "Manet: Portraying Life, Themes and Variations." In Manet: Portraying Life, exh. cat., Mary Stevens et al., eds. (Toledo: Toledo Museum of Art, 2012), p. 31. Stevens, MaryAnne, et al, eds. Manet: Portraying Life, exh. cat. (Toledo: Toledo Museum of Art, 2012), pp. 124, 128, 191, no. 36, ill., entry by MaryAnne Stevens. Locke, Nancy. 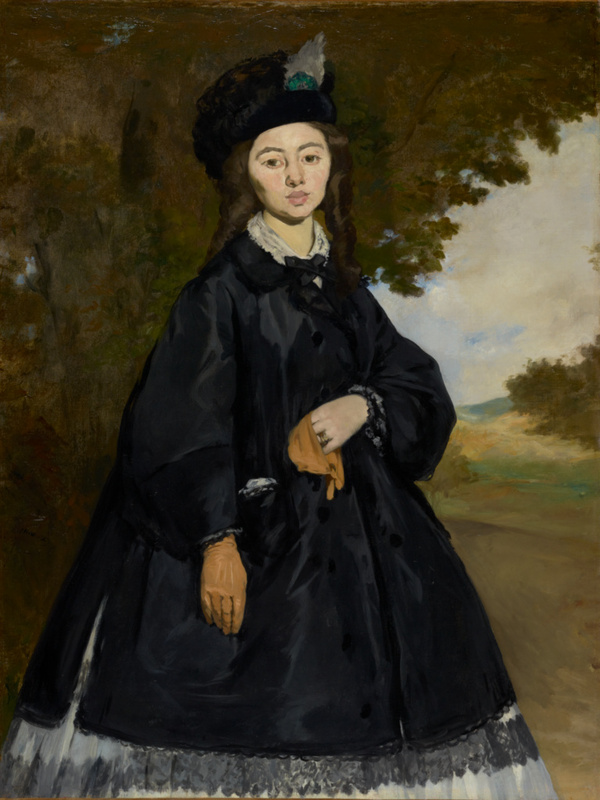 "Portraits, Identities, Pleasures: Édouard Manet's 'Isabelle Lemonnier with a Muff.'" In Impressionism and Post-Impressionism at the Dallas Museum of Art. Heather MacDonald, ed. (Dallas: Dallas Museum of Art, with Yale University Press, 2013), pp. 49, 50, 59n2, fig. 37.